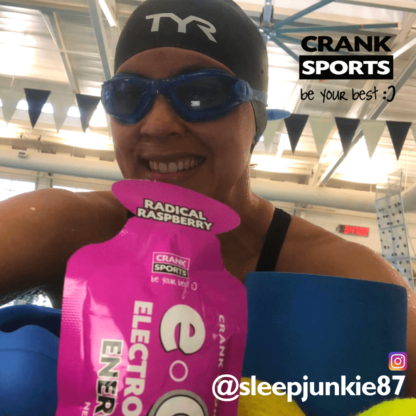 I’m a second year triathlete and part of team Tri Fusion Endurance Sports, of which the coaches (Astrid and Stefan Stroms) have been devout Crank Sport users. Last year I raced in several local 5k’s, sprint triathlons, and my first ever Olympic with great success. I placed 1st in my age group in a local 5K, 2nd in my age group for the Olympic distance triathlon, and first in two Las Vegas Tri club races “rookie division”. I completed my very first century ride with my teammate, and this year I’ve set my sights on completing IRONMAN St. George 70.3 in May. My favorite things about e-Gel and e-Fuel are the nutritional break down and science that goes into the products. Complex carbs for sustained energy are a huge plus especially on a 7 hour bike ride, or during an 8 hour half IRONMAN. I love they are easy on the stomach, and can depend on it to not put me in the bathroom, or on the side of the course.